You can create scripts for Harmony by using the Script Editor view. 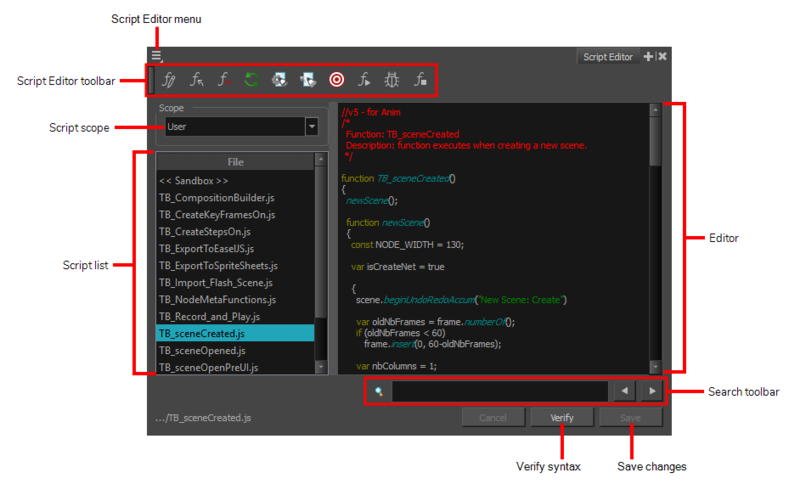 TIPTo help familiarize yourself with Harmony scripts, you can open the Script Editor view and look into the TB_sceneCreated script. This script is automatically executed when you create a scene. By default, it sets the scene's length to 60 frames and creates a basic layout containing a single drawing layer. You can customize this script to automatically set up scenes you create to fit your project's needs. In the top-right corner of the Camera or Drawing view, click on the Add View button and select Script Editor. The Script Editor view is added to your workspace. 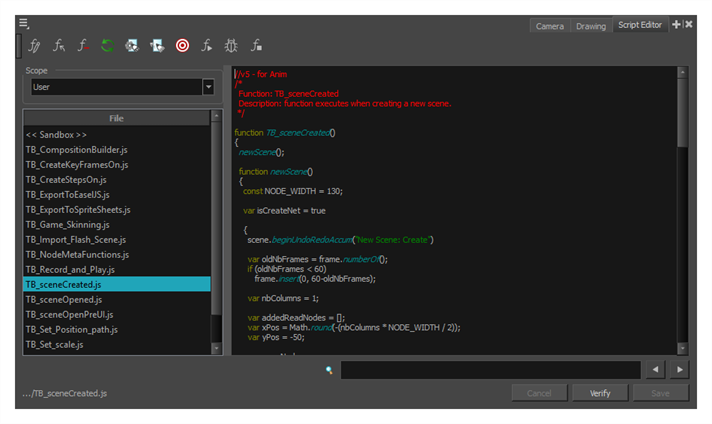 It lists all the scripts packaged with Harmony as well as any script you previously created. In the Script Editor toolbar, click the New Script button. From the top-left corner of the Script Editor, click on the Menu button, and select File > New Script. The New Script dialog box appears. Type in a name for your script and click on OK.
A dialog prompts you to select the location in which to create the script. User: Saves the script to your user preferences. You will be able to run and edit the script from any scene as long as you are logged in as the same user. NOTEIf you are using Harmony Stand Alone, the script will be saved to the preferences for your account on your computer. if you are using Harmony Server, the script will be saved to the preferences for your Harmony database user. Global: If you are using Harmony Server, select this option to save the script to the Harmony database's global script directory. Anyone who is logged in to the database will be able to edit and run this script. Environment: If you are using Harmony Server, select this option to save the script to the current scene's environment. Anyone will be able to edit and run the script as long as they are working on a scne inside this environment. 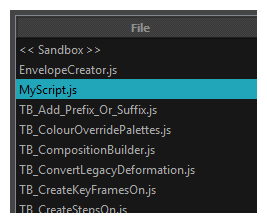 Your script is added to the list of scripts in the Script Editor. Select the script your just created in the list. You can now start editing your script in the script editor. Click on the text field in the right area of the Script Editor and start writing your script. The following is an example of a script that will display a message box saying "Hello World!" NOTE For information on how to use the Qt scripting language in Harmony, see Scripting Reference. You can also open the scripting reference guide directly from the Script Editor by clicking on the Menu button in the top-left corner and selecting Help > Scripting Interface Documentation.